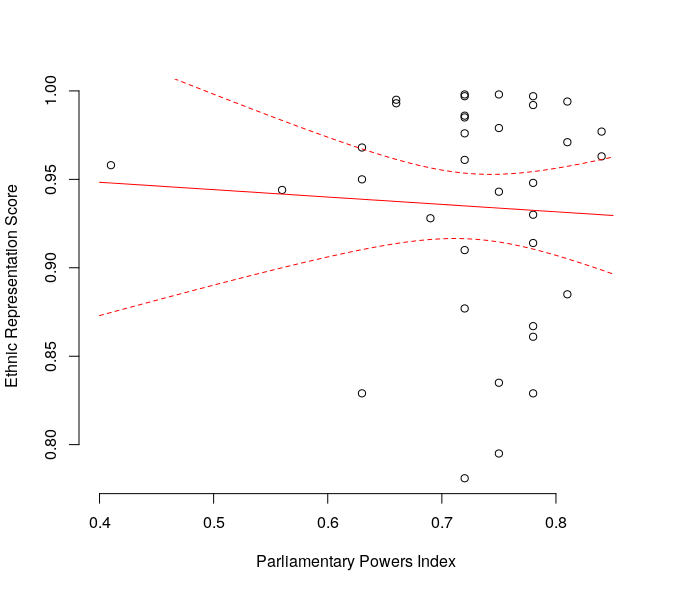 In their 2014 article, Leslie Schwindt-Bayer and Peverill Squire show that the political power of legislatures can affect gender representativeness of legislatures. In the article they discuss likely mechanisms and suggests that the same result applies to ethnic groups. The argument is that in a legislature with more professional power, need to provide representatives with incentives to compensate for their investments like long sessions. These incentives, in turn, encourage incumbents to preserve their seats and discriminate against under-represented groups. Sounds reasonable enough, but ever since collecting information on the ethnic composition of legislatures worldwide, I have been keen to empirically check such claims. I did so using the spreadsheet from the DICE Database and my own data on ethnic representation. This gives me 35 countries to have a quick look at the claim: there is no such correlation among the countries examined. Ruedin, Didier. 2009. ‘Ethnic Group Representation in a Cross-National Comparison’. The Journal of Legislative Studies 15 (4): 335–54. doi:10.1080/13572330903302448. ———. 2010. ‘The Relationship between Levels of Gender and Ethnic Group Representation’. Studies in Ethnicity and Nationalism 10 (2): 92–106. doi:10.1111/j.1754-9469.2010.01066.x. ———. 2013. Why Aren’t They There? The Political Representation of Women, Ethnic Groups and Issue Positions in Legislatures. Colchester: ECPR Press. Schwindt-Bayer, Leslie, and Peverill Squire. 2014. ‘Legislative Power and Women’s Representation’. Politics & Gender 10 (4): 622–658. doi:10.1017/S1743923X14000440.